The mid-1990s saw the birth of Napa Valley’s ‘Cult Cabernets’, as a new breed of fearless estates exploded onto the scene. And while 1994 and 1997 are widely lauded as the decade’s headline vintages, JEANNIE CHO LEE finds much to enjoy in the 1995s – not least their natural, unmanufactured style. The 1994 vintage would turn out to be a turning point for these small brands who were, at the time, making just a few hundred cases of wine a year. High ratings by Robert Parker and Wine Spectator for the 1994s provided them with encouragement, and more small wineries began to surface with dreams of achieving the elusive 100 points. I found that same authenticity and energy when tasting through the 1995 vintage during a visit to Napa in March this year. Abreu Vineyards was my standout among 18 wines sampled. In a mini-vertical at Abreu, I favored the 1995 over the 1994 and 1996. It’s better defined – more precise and pure than the 1994 and more intense and focused than the 1996. If only they had made more than 400 cases of this vintage! It is unfortunate, too, that the 1995 vintage followed such a great year. After the wonderful, uneventful 1994 growing season, when a warm spring and mild summer allowed slow, even ripening, 1995 was fraught with challenges. First, the severe winter floods and cool temperatures in the spring delayed growth and maturity. The weather was cool during bud break and flowering but punctuated by storms. Hail in June caused minor damage, but it was the erratic summer months that had vintners worried – cool on some days, scorching hot on others. Quantities were down and harvest was late – Colgin remembers bringing in grapes at the end of October. When it came to its release two years later, critical response to the vintage was muted. To cloud matters further, the wines were made against a backdrop of uncertainty. 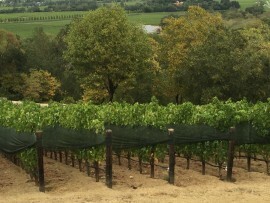 In the 1990s, many vineyards were being replanted because of phylloxera, the aphid that feeds on the roots of vines and eventually kills them. For those who replanted late, the 1995 vintage would have been among the last made from older vines. For those who decided to replant early on, it was among the first vintages made with extremely young vines. Regardless of the age of the vines or the challenging growing season, the 18 wines I tasted were uniformly excellent. Sixteen wines were selected to be tasted semi-blind (another three on their own): I knew which wines were in the lineup and that there were three flights, each of five to six wines, to be tasted over three hours. I did not know in what order the wines were being poured. The purpose was to better understand the vintage while not being influenced by the label. I always liked the vintage whenever I was fortunate enough to come across it, but this tasting made me appreciate the high quality in what has become a forgotten year. The 1990s mark the decade before ripeness was pushed to extremes in Napa, when freshness and vibrancy still trumped concentration and power. The tannins of the 1995s are very well managed and the wines are mostly about 13 percent alcohol. There is energy and precision in the vintage, with the top producers handling the extreme weather conditions to their benefit and the stress pushing the vines to produce depth and complexity from a small crop. Among the 18 wines, most are youthful and at their peak, with only a few showing signs of age. The 1995 is an excellent vintage, on a par with the lauded 1994 and perhaps surpassing it in some cases (notably on account of its longer drinking window). Rave reviews and high scores for the 1994s have, though, largely placed the 1995s in its long shadow. Yet while the 1994s are sumptuous and round, the 1995s are fresh, joyful, lifted and layered. If you are fortunate enough to have any in your cellar, you can easily keep them for another decade or two. If you don’t, it’s worth looking out for them at auction – they are much cheaper than the 1994s and are just as good, or better. A simply gorgeous wine. The nose is sweet and suggests riper flavors than those that emerge on the palate, which is precise in its detail with freshness and vibrant acidity. It’s also explosive in its array of violets, cassis and plum notes, with a finish that lingers forever. Elegant but intense, with layered, nuanced flavors that are delicate and pure. Only 13.4 percent alcohol and it tastes even lighter. Phenomenal. A beautifully balanced Cabernet with lovely, subtle flavors of dark earth, truffle and sweet spices. This wine has an elegance and confidence that is reminiscent of an aged Bordeaux from a top terroir. Still youthful and fresh, the palate offers a gorgeous array of flavors, from subtle herbs and spices to lush dark berries. A wine marked by balance, velvety texture and a seamless structure. At its peak now but should age well over the next decade or two. Beautiful nose of roasted herbs and a hint of meat. This is a savory wine with layers of flavors that range from blackberry to herbs and spices – notably nutmeg, rosemary and thyme. Youthful and fresh with a good acid backbone and velvety tannins, it became better and better in the glass over three hours. At its peak now but with decades of life ahead. One of the least evolved 1995s in the line-up. The nose still offers primary fruit aromas of red currant, cassis and plums. Incredibly youthful on the palate with amazing depth and vitality and a fine, persistent length. The energy of this wine, combined with its layered, almost delicate, flavors, offers great appeal – it maintained its vigor and youthfulness over three hours in the glass. This is a subtle wine that could easily be overlooked, and while it does not have the generosity and intensity of the 1994, it is incredibly fresh with its own vibrant charm. Ripe, generous and concentrated. Still youthful and vibrant, Harlan was among the most dense and rich of those tasted. There is no mistaking the Harlan hallmark of incredible density and power. The wine is still youthful and is only just beginning to open up. Firm tannins and dark fruits, but with a wonderful freshness that adds to its appeal. A wine with a long life ahead. An appealing, pretty nose of cedar, eucalyptus and violets. The palate is balanced by ripe tannins and generous, sweet dried berries and cedar notes. At its peak now with evolved flavors just starting to surface, adding nuance and depth to a wine that shows great freshness and lightness. Vibrant and lifted with a beautiful nose of dried rose petals, orange zest and violets. The palate is light with a wonderful freshness. A well-composed wine of great finesse and depth; elegant, with gentle, ripe tannins. Very pretty – lighter and more gentle than the Bryant Family Cabernets from the 2000s; ready to enjoy now. A pretty, perfumed, elegant Cabernet that offers a wonderful floral bouquet. Still youthful, with very little sign of age or evolution, and soft plum, eucalyptus and blackberry in their primary stages. Floral notes with mint and rosemary emerge on the finish. An attractive, balanced, elegant wine that is a pleasure to enjoy now. Should keep for at least another decade. Tannic and firm with youthful vibrancy and intensity. This is a wine for cellaring rather than enjoying now. Flavors are closed with hints of black soil, savory herbs and black currant. The structure is dense, with chewy, firm tannins and a fairly long finish. There is potential for this to open up and display further nuance; for now it is tightly wound even after a few hours in the glass. A structured wine with mocha, plum and dark cocoa flavors, and firm, grippy tannins; as befits its heritage, it is Bordeaux-like in its texture, elegance and lightness. There isn’t the opulence or richness of a typical Napa Cabernet here, but the wine is focused, still youthful, with fresh acidity and wonderfully detailed flavors. A persistent finish. Enjoy now. An evolved, delicious wine with notes of leather, mushrooms and tobacco. At its peak, offering silky tannins and the gentle sweetness that comes with evolution. Still firm, with beautiful flavors of dried berries and savory herbs. Ready to drink, but the freshness and structure suggests it still has a long way to go. Still in its prime, with freshness complementing primary notes of blackberry and cassis. Firm tannins and earthy flavors that are reflective of hillside and mountain fruit. Should age well over the next 10 years or so. A wine with structure and character. A delicious vintage for Staglin – this Cabernet is fresh, lively and at its peak. Complex, with layers of dark fruit just starting to evolve into spices, herbs and leather. Perfect now; should keep well over the next decade. Structured and intense with the dark berries typical of mountain fruit – firm, astringent and dense. Still youthful and tightly wound by firm tannins; this wine would benefit from another five years in bottle. The savory, restrained quality stands out. Elegant and pure with layered notes that range from fresh herbs to cassis and violets. Hauntingly beautiful, fairly delicate, with flavors that are layered and long. This is a seamless, balanced wine at its perfect peak. Drink soon. More evolved than the 1996 with a leather and cigar nose; the palate is delicate, with firm tannins, dried tea-leaf notes and dried violets. Drying out in the finish. Enjoy it now. Chunky and generous with notes of sweet cedar, cocoa and ripe plum. Sweet oak, vanilla and ripe fruits dominate the mid-palate. This Insignia is harmonious and delicious to drink, even though the mid-palate is broad. Enjoy now. A mature Silver Oak with overt bottle-aged characters of leather, tobacco and dried herbs. Tannins are dry and dusty, the fruit starting to fade. Would have been better several years ago.